Eight years in the making and our dreams are almost a reality! SNARR Northeast has purchased a shelter property so that we can continue our mission of giving Hope to the Hopeless. This adoption center will allow us to save countless more animals especially when our foster homes are full. 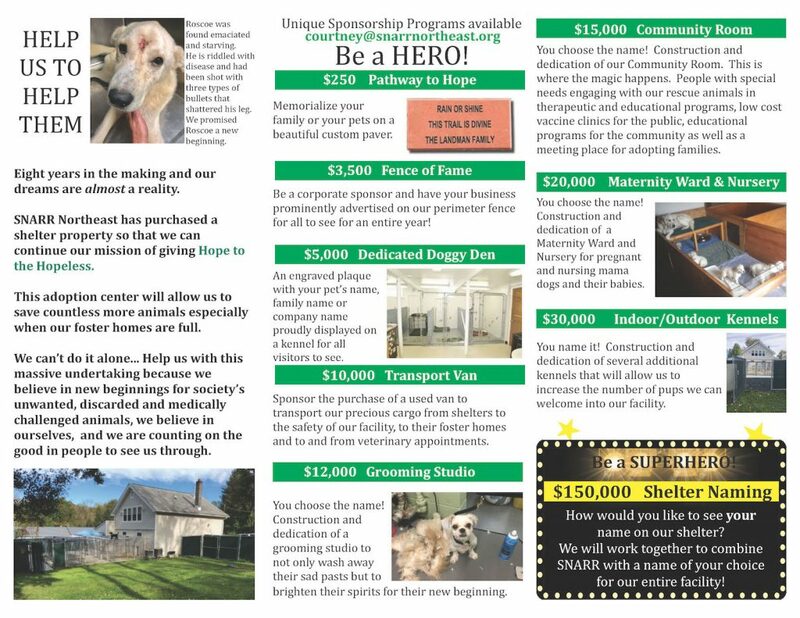 Help us with this massive undertaking because we believe in new beginnings for society’s unwanted, discarded and medically challenged animals, we believe in ourselves, and we are counting on the good in people to see us through. Download the brochure to learn more. To make a donation, please visit our Donate page. I must comment, that your Rescue, has been the most courteous, and responsive to date. I heard from your Rescue, twice, to my amazement. I truly hope, Amos will become a Shore Dog, checking out the height of the Waves at the Belmar Beach!